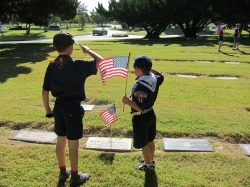 We are a Cub Scout pack located in Orange, CA. sponsored by St. John's Lutheran Church since November 1, 1952. We are a member of the Lutheran Association of Scouters. As part of the Canyons District of the Orange County Council of the Boys Scouts of America, we have 5 dens for our pack of 50 scouts. Monthly meetings are held on Monday nights at St. John's Lutheran Church and for more information or to join, please contact our ﻿webmaster﻿.